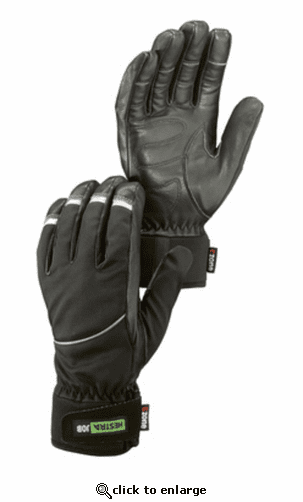 Lined wind and waterproof leather gloves for cool, wet weather conditions. For the length: Measure the distance between the wrist and the tip of the middle finger. The circumference of your palm should be measured at its widest point. Recommended size is an indication. Hands are different and some models have a tighter fit than others. The family business Martin Magnusson & Co. was founded in 1936 and is now run by the third generation of Magnussons. Both design and development is done at the headquarters in the town of Hestra. Our gloves are manufactured in our own factory and we personally buy all leather, cloth, wool and other materials. This gives us complete control of the entire production chain and ensures high quality at every stage. Several of our models are handmade by some of the most experienced glove makers in Europe. In 2012, we produced over 2 million pairs of gloves. The company has about 35 employees in Sweden. We also have a subsidiaries in the United States and Germany as well as agents, distributors and retailers in over 30 countries. In addition to Scandinavia, the United States, Alp- countries and Japan are our largest markets. The owners and managers are brothers Claes and Svante Magnusson. They have two sons – the fourth generation of Magnussons – who also work at Hestra. HESTRA is one of the leading international glove brands in skiing, outdoor recreation and leisure. 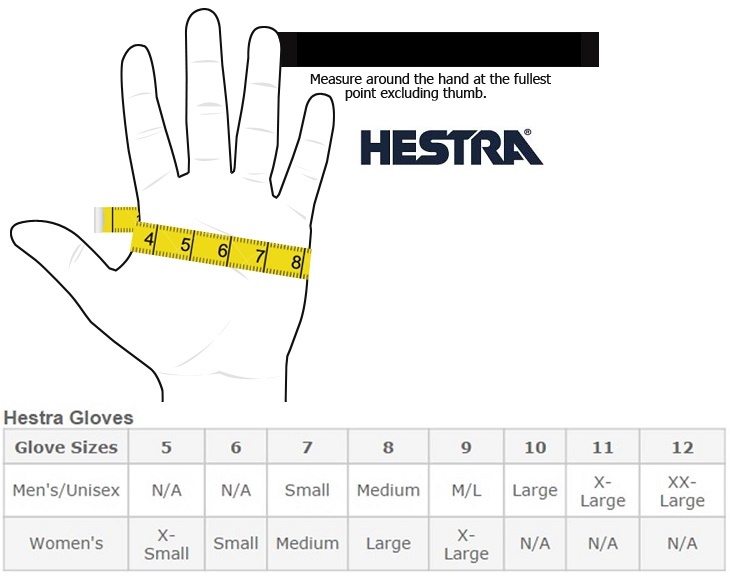 There are also Hestra glove models for professional uses such as construction work. Design and product development is done in cooperation with some of the world's best professional skiers and adventurers. Hestra gloves are made to last. With some love and care they will last even longer. Good for you, good for the environment. 1) Grease the leather regularly and it will resist moisture, wear and tear better. Moisten the leather a little first. Use a polishing cloth and rub in the grease until the leather is saturated. Do this in the evening and the grease is absorbed during the night. 2) If you have gloves with breathable materials like Gore-Tex, you should avoid silicone impregnation. It clogs the pores and reduces the material’s breathability. 3) With the carabiner clasp that comes with some models, you can easily attach the gloves to a backpack. In that way, you don’t risk losing them, and they can dry without losing shape. 4) Dyed leather may stain clothing when wet, so don’t place a wet glove on other garments. Choose a model with a natural leather color if you do not want to risk bleeding. 5) Gloves rarely get damaged while skiing. Instead, the edges of skis and boot buckles are normally the cause of damage to your gloves. Be careful when handling your skis or boots! 1) Dry your gloves at room temperature, avoid open flames, heaters, tumble- driers and ovens. 2) Gloves dry best in an upright position. Some models come with a carabiner clasp that, apart from keeping the gloves together, also is useful when drying. 3) Do not turn lined gloves inside out. The liner, insulation and membrane can be difficult to put back into place. 4) Gloves with a removable lining dry faster when the liners are removed, and the removable liners are also easy to wash. Dirt clogs pores and fibers reducing breathability. However, wool liners must be hand washed and dried on a flat surface. 5) We do not recommend washing leather gloves frequently. If you do wash them, put on the gloves and wash with soap and lukewarm water. Squeeze out the water gently without twisting. Models without several layers or leather can be machine-washed at 40°C or less. The HESTRA GLOVE SYSTEM is based on the layering principle – the idea of wearing many different functional pieces of clothing. By using layers of gloves, you can regulate the temperature. 1) Next to your skin, wear a liner that carries away moisture and creates a thin, warming layer of air around the skin. A thin liner worn inside a glove increases heat by about 20 percent. 2) The base gloves are the models you use most of the time. They keep your hands warm in normal cold temperatures and also provide good protection against wind and moisture. For more warmth, even on the ski slopes, you can supplement base gloves with liners and shells. 3) In extremely cold weather you can add on with a shell glove. This creates another layer of air that insulates against cold. With a liner and shell glove, insulation increases by approximately 50 percent compared to only wearing a base glove. There are many combinations – select models based on your hand’s needs and the activities and weather conditions you expect to encounter. For example: when placing tent stakes in the cold, use thin liners. When hiking up a mountain, your body temperature rises, but the wind can still chill your hands. Use a windproof model that is highly breathable. When you stop to rest, you need more insulation than when you are moving. Put on a shell glove last. There is also an element of safety to consider. If you are in danger of being significantly chilled, your body will not prioritize the hands, but vital organs like the heart. In this case, an extra insulating layer can help you out, preferably a mitten model that you can have rolled up for easy access.